Preferred Stock Investing, Third Edition is one of the most highly reader-rated books of any kind available for sale in the United States (Amazon 4.5 stars). 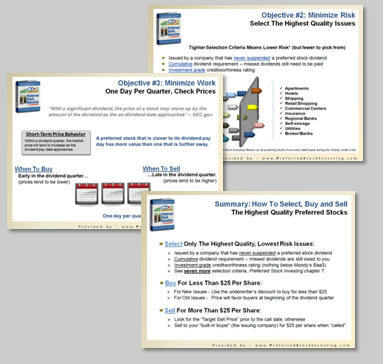 To receive the free April 2010 update to Preferred Stock Investing, Third Edition just follow the instructions on the first page of chapter 15 in the book. The Global Credit Crisis delivered historically low market prices for historically high dividend rates on the highest quality preferred stocks ("CDx3 Preferred Stocks" - see sidebar at the top of this newsletter). Since prices have now recovered we are looking at enormous "unrealized" capital gains in our brokerage accounts. Because of two specific characteristics of preferred stocks, there is a simple maneuver that allows preferred stock investors to simultaneously (a) pocket these capital gains and (b) reduce their overall investment risk while simultaneously (c) leaving their dividend income unchanged. If you've been wondering how to pocket your preferred stock capital gains without reducing your dividend income, keep reading. 2. On the other hand, preferred stock dividends are paid to you based solely on the number of shares that you own regardless of market price fluctuations or your original purchase price. That means that dividend income from preferred stocks is less at risk than the unrealized capital gains that we are sitting on. So if we can "convert" our unrealized capital gains into dividend-generating shares, our risk profile goes down substantially. What I am about to show you is how to convert an "at-risk" unrealized preferred stock capital gain currently sitting in your brokerage account into fixed dividend cash that is not affected by market price fluctuations - and do so without changing your income. And I am going to use real data from two real CDx3 Preferred Stocks to show you how this is done. I'll also show you how to quickly find the trading symbols of these CDx3 Preferred Stocks, but for now let's just refer to them as preferred stocks A (that you are going to be selling) and B (that you are going to be buying). Remember as I walk you through this maneuver that I am using real data for real CDx3 Preferred Stocks for this example. Look down the "Gain" column on your brokerage statement and find a preferred stock that currently has a gain (i.e. today's market price is greater than your original purchase price). For this example I will refer to this preferred stock as Preferred Stock A (PFD-A). Let's say that during the Global Credit Crisis you purchased 100 shares of PFD-A for $20 per share and PFD-A has a 7.875% declared dividend rate ("coupon rate"). So you have a $2,000 investment in PFD-A. A preferred stock that has a 7.875% declared dividend rate pays $1.97 per year in dividend income ($25 x 7.875%) per share regardless of the market price. 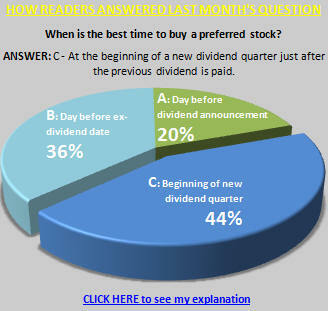 That's $0.492 per quarter for every share that you own of PFD-A in fixed dividend income. So your 100 shares of PFD-A are currently generating $49.20 per quarter in dividend income for you. Again, with preferred stocks this $49.20 in dividend income is fixed by the number of shares you own (100) and is not affected by market price fluctuations. So when we are done with this example we want to be sure that we are still earning at least $49.20 in quarterly dividend income; we want to collect our capital gains without reducing our income. 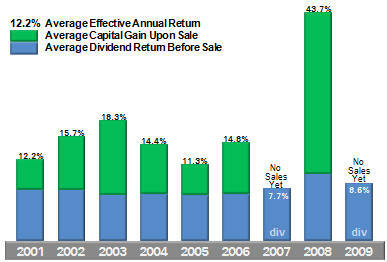 Now let's say that here in 2010 the market price of PFD-A has recovered to $25 per share. Since you originally paid $20 per share, and the shares are now selling for $25, you are looking at an unrealized capital gain of $5 per share ($500) staring back at you from your brokerage statement. As nice as it is to look at, this capital gain is unrealized; it is doing nothing productive for you whatsoever. It is certainly not earning you any income. The only way to cash in that $500 is to sell the shares; but selling the shares puts an end to the great dividend income. What we want is to cash in the $500 capital gain without reducing our dividend income. Selling your 100 shares of PFD-A for $25 per share generates total proceeds of $2,500. This sale converts your unrealized capital gain to cash (you "realize" your $500 capital gain when you sell). At today's price of $25 per share, PFD-A has a current "yield" of 7.875% (yield% = ($25 x 7.875%) / $current-market-price). Using the $2,500 now in your pocket, you are going to purchase another CDx3 Preferred Stock (PFD-B). But instead of buying 100 shares of PFD-B, you are going to purchase enough shares of PFD-B such that they generate at least $49.20 per quarter in dividend income for you, the same as you were earning with PFD-A. As it turns out, there is an easy way to identify such a preferred stock for your purchase. All you have to do is find a preferred stock that has the same current yield as PFD-A (7.875%). Let's say that you find PFD-B that has a declared dividend rate of 7.0% and is currently selling for $22.25 per share (more on how to quickly find these purchase candidates in a moment). With the $2,500 from your sale of PFD-A you can purchase 113 shares of PFD-B at today's market price of $22.25 per share (again, these are real numbers; nothing is made up here). Where you use to own 100 shares of PFD-A, you now own 113 shares of PFD-B. You have now "converted" your $500 capital gain, that was at risk of evaporating when prices head back down again, into 13 additional dividend-generating shares of PFD-B. But what about your dividend income? Shares of PFD-B pay $1.75 per year in dividend income ($0.438 per quarter). So the 113 shares of PFD-B that you just purchased earn you $49.49 per quarter in dividend income (113 x $0.438), which preserves the dividend income that you were making when you owned 100 shares of PFD-A. The crisis-generated unrealized capital gains that preferred stock investors currently have in their brokerage accounts were generated by incredibly low market prices during the Global Credit Crisis and the spectacular market price recovery of high quality preferred stocks since then. But the unrealized capital gains that we see in our brokerage accounts are "at risk" since market prices go up and back down over time. The 2-step maneuver described here allows you to convert your unrealized capital gain, which is exposed to the risks of fluctuating market prices, into a stream of dividend income that is protected from such fluctuations (since preferred stock dividends are based on the number of shares that you own, not prices). So the end result is that you have converted your crisis-generated unrealized capital gain into protected dividend-generating preferred stock shares, lowering your overall risk profile, without reducing your income. To do this maneuver you need to know (a) which preferred stock to sell and (b) which preferred stock to buy such that your "at risk" unrealized capital gain ends up being converted to dividend-paying shares without changing your dividend income. Your selling candidates are identified for you in your brokerage account. Preferred stocks listed with an unrealized capital gain are candidates to sell for this maneuver. Your brokerage account will also list the current yield of these issues. Identifying the candidates to purchase is just as simple. You are looking for preferred stocks that have the same (or better) current dividend yield as the preferred stock that you have decided to sell. Where can you find a list of the highest quality purchase candidates? Each month subscribers to the CDx3 Notification Service (my preferred stock email alert and research service) receive the "CDx3 Bargain Table" that shows CDx3 Preferred Stocks that are at a point in time that tends to favor buyers (relatively low prices). The monthly CDx3 Bargain Table shows the current dividend yield for each issue. The table at right presents the current CDx3 Bargain Table (edited for presentation here). The fourth preferred stock listed is the PFD-B issue used in the above example. Once I had decided to sell PFD-A, which has a current yield of 7.875%, it was a simple matter to then look down the Dividend Yield column on the current CDx3 Bargain Table and find an issue with a similar current yield (the fourth issue listed shows a yield of 7.865%, close enough for our purposes here). 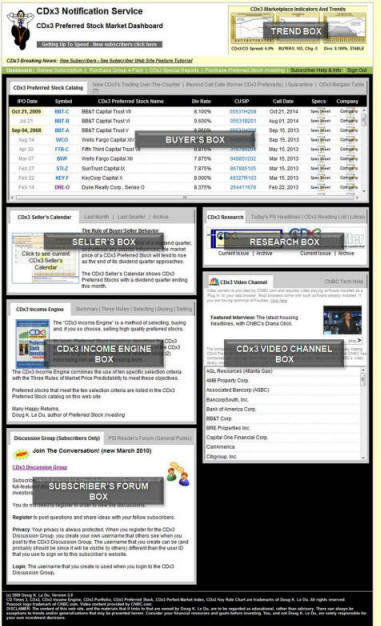 Having access to the CDx3 Bargain Table allows subscribers to quickly and easily convert your preferred stock capital gains into protected dividend income. This benefit alone is easily worth the price of a subscription to the CDx3 Notification Service. See the interesting testimonial quote at the top of this CDx3 Newsletter. The CDx3 Notification Service is the most comprehensive resource available for preferred stock investors. 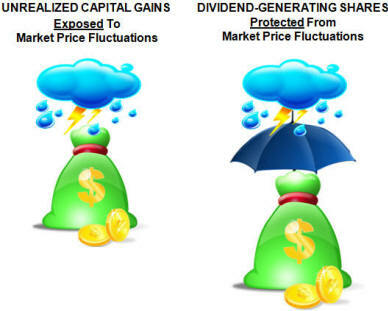 Do not allow your unrealized preferred stock capital gains to evaporate. Subscribe to the CDx3 Notification Service (see reader comments) today. Torchmark is a $4.4 billion insurance company founded in 1900 and headquartered in McKinney, Texas. Torchmark sells very specific life and health insurance products to a segment of the population that many of their competitors have vacated - the middle-income market. 46% of U.S. households (51 million) are in the $25,000 to $75,000 income range, but most financial institutions and insurers target the 27% of households with income exceeding $75,000. Torchmark's strategy has been to segment the middle-income market around specific demographics and sell specifically tailored insurance products under highly reputable and recognized brand names into those segments. You can see the net operating income per share results on the first chart here. Torchmark has been successful at improving this key metric even during the most trying of economic times when middle-income Americans, Torchmark's primary customers, are suffering near-record unemployment. Few know that Torchmark is the owner of American Income Life Insurance Company, First United Life Insurance Company, Global Life and Accident Insurance Company, Liberty National Insurance Company, United American Life Insurance Company and United Investors Life Insurance Company. Life insurance premium revenue accounted for 62% of total premium revenue during 2009 and 38% coming from health insurance premiums. Uncertainty related to recent healthcare legislation suggests some risk regarding Torchmark's healthcare segment. Another reason behind Torchmark's 100+ year success is its conservative investment strategy. Torchmark makes money the same way that other insurance companies make money. They collect premiums against insurance policies and, to the extent that they do not have to pay out claims, they invest the cash. While many of Torchmark's less conservative competitors pursued the risky investments that we have read so much about over the last three years, Torchmark's investments are primarily in investment grade, fixed maturity securities with no direct exposure to sub-prime or Alt-A mortgages, default credit swaps or derivatives. As itemized in this second table, 93% of Torchmark's investment portfolio is in investment grade, fixed maturities. As of December 31, 2009, this fixed income portfolio had an average life (years to maturity) of 21.3 years with an effective yield of 6.44% (source: Standard & Poor's Stock Report, May 1, 2010). Learn more about Torchmark: Company website | Profile | Upgrades/Downgrades | Recent News. When interest rates go up, what happens to preferred stock prices? - Preferred Stock Investing Reader's Forum. Knowing something - anything - about the future market price behavior of an investment that you are considering is the Mother Lode of investing. And with CDx3 Preferred Stocks, we know quite a bit and we know it in advance. This knowledge allows preferred stock investors to time their buying and selling activities to take advantage of known factors that move preferred stock market prices up and down over time. CDx3 Preferred Stocks have a five-year lifespan - the period between the issue's introduction (the IPO date) and its "call date" five years later. The call date is when the issuing company regains the right to purchase your shares back from you (and pay you $25.00 per share in the event that they do so). During this five-year period prior to the call date, the market price of a CDx3 Preferred Stock will tend to follow three specific rules - the Three Rules of Market Price Predictability from Preferred Stock Investing, chapter 3. One rule is for the short-term within a dividend quarter, a second for the longer-term prior to the call date and a third rule that tells us about how the market price will behave as the call date approaches (the "end-term"). These three rules were put to the ultimate test during the Global Credit Crisis and performed perfectly; market prices performed just as the Three Rules of Market Price Predictability said they should. Many preferred stock investors are in it purely for the great dividend income; that is, they are buy-and-hold investors. Even if they could earn three, four or five quarters worth of dividend income by selling and collecting a big capital gain, they simply do not want to take the time needed to do so. These preferred stock investors will consistently see annual returns between 6.5% and 9.0% while expending very little effort beyond determine their next purchase candidates (a list of which is provided to subscribers to the CDx3 Notification Service). But other preferred stock investors can use the Three Rules of Market Price Predictability to not only time their purchases, but also their selling activities. Since CDx3 Preferred Stocks produce fixed annual dividends in the 6.5% to 9.0% range, selling at the right time and adding on a nice capital gain allows these investors to consistently push their effective annual return over 10% (chapter 15 of Preferred Stock Investing presents an itemization for every CDx3 Preferred Stock issued since January 2001 showing these results). What makes this possible is that the direction of CDx3 Preferred Stock market prices is related to the direction of interest rates throughout the U.S. economy. Knowing how this relationship works, and knowing it advance, gives preferred stock investors an enormous advantage for timing their buying and selling over time. The question this month for preferred stock investors: When interest rates go up, what happens to preferred stock prices? (C) They go up with interest rates. The correct answer to this question is (A): As interest rates go up (namely the federal funds rate), the market prices of preferred stocks will tend to go down (creating buying opportunities); the two move in opposition to each other. The reverse is equally true; when rates go back down again, market prices will tend to come back up (creating selling opportunities). The federal funds rate is currently near-zero and has been held there by the Federal Reserve to help stimulate the economy. Analysts are in general agreement that this key interest rate is likely to be going up some time within the next six to twelve months. That means two things for preferred stock investors: (1) once rates start heading up again, new CDx3 Preferred Stocks will be issued at higher dividend rates and (2) market prices of older, lower-paying existing issues will tend to trend lower. This will create a "buyer's market" (in 2011?) where CDx3 Preferred Stocks that pay increasingly higher dividends are able to be purchased at increasingly lower market prices. Since CDx3 Preferred Stocks pay your dividends based on the number of shares you own, and not the current market price, your income remains the same regardless of these market price movements; the market price movements create buying and selling opportunities over time. They do not affect your dividend income. This is the Mother Lode of investing. We know how the market price of CDx3 Preferred Stocks is going to behave and we know it in advance. We also know that interest rates will change multiple times over any five year period so those following the preferred stock investing method described throughout my book, Preferred Stock Investing, are able to time their buying and selling activities accordingly, consistently producing effective annual returns in excess of 10% (see Preferred Stock Investing, chapter 15 for itemization). One of the effects of the Global Credit Crisis was to transfer trillions of dollars in debt that was in private hands onto the balance sheets of governments and their central banks all over the world. Under this kind of pressure, the weakest show their cracks first. Greece has been living well beyond its means for over a decade, largely due to huge increases in public employee payroll and pension benefits coupled with massive increases in government spending and widespread tax evasion. Greece's national debt has ballooned to 115% of its Gross Domestic Product (source: European Commission). U.S. banks have essentially zero exposure to Greek debt so in real dollar terms, these events appear to mean very little to us. Of more interest will be the effects on the dollar/euro exchange rate and the upward pressure these events may put on U.S. domestic inflation, which is the one thing we really do not need right now. Coincidently, at the same time that the Greek tragedy is unfolding, the SEC is pursuing a very public fraud complaint against Goldman Sachs. Whatever the merits of the case, political or factual, I have noticed that the market prices of financial stocks, including preferred stocks issued by investment banks, take a quick dip with each new headline in this case. I first noticed this in the days following the SEC/Goldman announcement in mid-April and posted an alert on my blog on April 20 (see my blog). You can receive articles that I post on my blog for free throughout the month by clicking here. On days when there are big alarming headlines regarding both the Greece and SEC/Goldman stories, check the market prices of the highest quality preferred stocks issued by our investment banks. Some real bargains have presented themselves for a day or so when such headlines appear, creating some spectacular short-term buying opportunities for preferred stock investors; the more alarming the headline the better. Looking for a quick way to identify the highest quality preferred stocks issued by U.S. investment banks? The current issue of the subscriber's newsletter, CDx3 Research Notes, identifies the top 11 issues to watch. The Greece/SEC/Goldman drama will not last forever. The EU and IMF will help Greece out and the SEC and Goldman will settle. Don't get left out. Subscribe to the CDx3 Notification Service (see reader comments) today.